This fast-flying Papilionidae butterfly is common in Singapore. However, it is a forest-dependent species and rarely found in urban parks and gardens. It often puddles in the company of other species in the family, like the Common Bluebottle, Five Bar Swordtail and Tailed Jay. It is fast flying, skittish but males can often be found puddling at damp streambanks or forest paths. 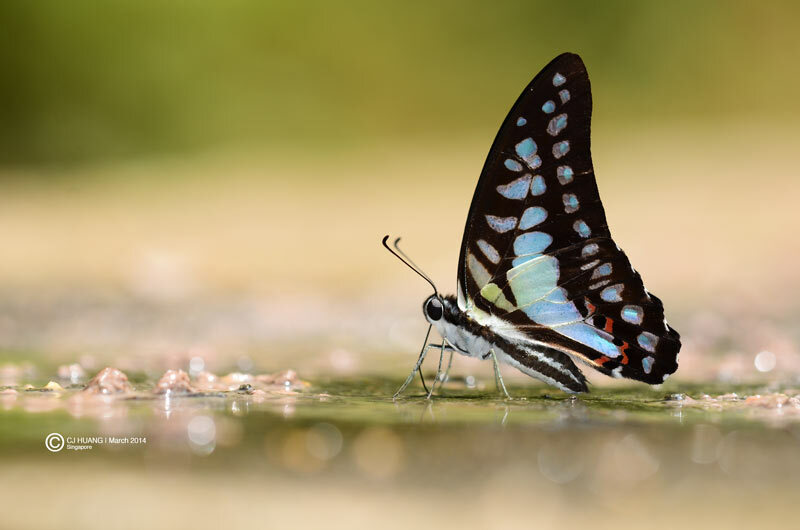 This puddling Blue Jay was shot by ButterflyCircle member Huang CJ in the nature reserves. The upperside features a blue macular band with broad black borders on both wings. There is a series of blue submarginal spots on both wings. The underside is silvery blue and there is a series of red tornal spots on the hindwing. The black costal bar on the underside of the hindwing, is conjoined with the black basal bar, and this distinguishes the Blue Jay from the several other lookalikes in the genus.